The desire to diversify his life encourages allwe have to look for exciting sessions designed to paint the monotonous everyday life in bright colors. If your passion - fruit and vegetable garden, why not transform your private plot of the original plant figure - duck or peacock, elephant or lion ... or maybe you prefer floral car? 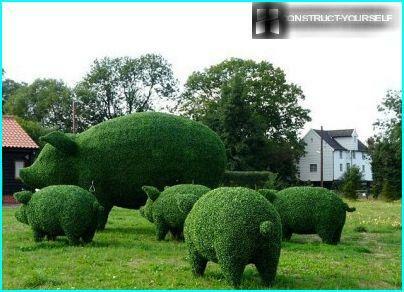 The ancient art of topiary, perekroennoe with a modern twist, will allow you, not straining to create a topiary with their hands literally in one day. Of course, provided that you have not conceived to make something big that affects its dimensions owners adjacent land. For a start, it is better to try your hand at creating your own small garden figurines in the framing technique "topiary", gradually moving on to more complex compositions. Learn how to make your own hands when Topiaryready-made metal frame, the power of any gardener holding in due measure of patience and perseverance. First, you need to choose the framework for future green sculptures. 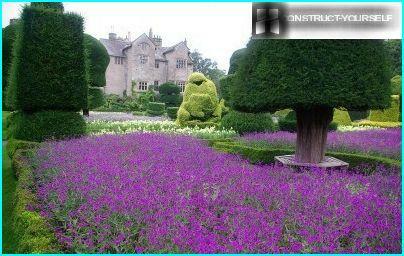 Its size and shape have to fit harmoniously into the landscape of the garden. 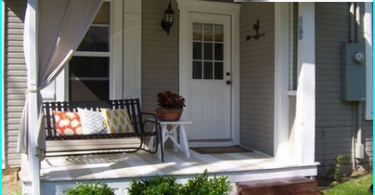 Better to take a small but expressive form - after all, you are creating an accent that would have to attract attention. Ready-made frames, which can be purchased inspecialized gardening stores, made of 3.2 mm wire. They constitute a lattice structure with sufficient clearance to be able to get inside. In addition, in the upper part of the frame is the cover, which is designed to further simplify the access to the "internals" of the metal structure during filling its substrate - a mixture of land with peat or sphagnum moss. Before you start to fill the frame, mossyou need to soak in warm water for about 30 minutes. 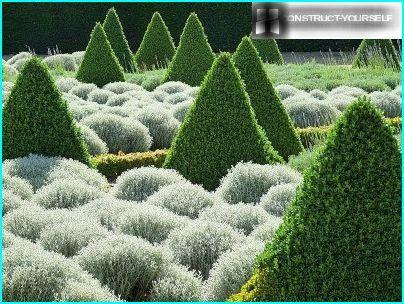 Filling the structure of the future Topiary substrate must be prudent to create wells, which are then planted in the ground cover or curly, or succulent herbaceous horticultural crops. For such purposes, it is ideal: young, saxifrage, sedum, loosestrife, ivy, vines. In the formation of twine Topiary plantsearthen room moved from the plastic container in a metal mold, and the shoots are distributed along the frame and fasten U-shaped staples. 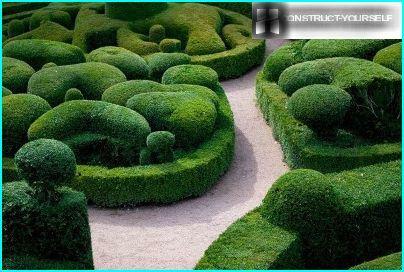 If the figure to create a topiary medium or large size, to facilitate its weight substrate placed inside sachets of crushed foam. Care involves carcass Topiaryregular watering and fertilizing, and pruning pinched. It should be remembered that such a green sculpture can not be left to spend the winter in the open air - it is better to bring in an unheated room with temperatures around 5 degrees. 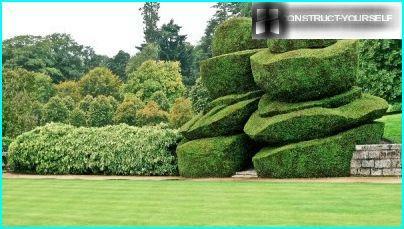 If the weight or volume Topiary does not allow - you can cover it with wood, insulated with straw or foam, duct. 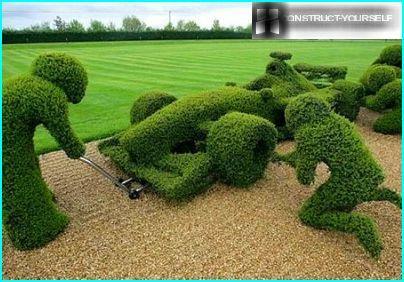 In an effort to further accelerate the process of creatinggreen sculpture complex form, was coined express Topiary. 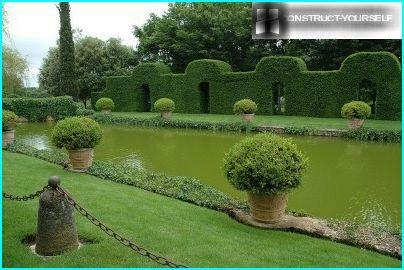 The essence of this method of forming Topiary simple - spring in open ground planted twine plant, such as periwinkle, girlish grapes, hops or ivy, quickly inclined to form sprouts. 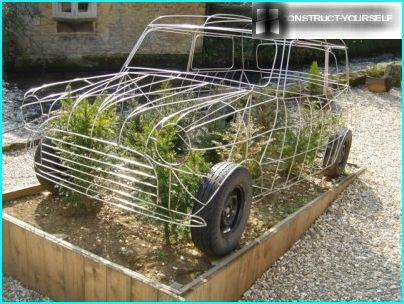 Then, set top landingmetal mesh frame, which serves as the basis for creating topiary. As the growth of plants branches distributed along the frame and secured with a rope made of natural material or trimmed. By the end of the season overgrown frame, metal rods completely disappear under a green cover - you just do not forget to water and feed the Topiary. Of course, even the Roman gardenersWe could not assume how modern society will transform the classical park art, similar in design sculptural modeling. 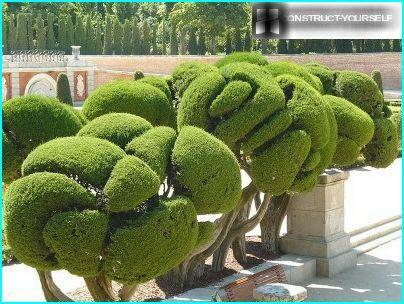 Indulging topiary, they did not try to speed up the process of creating a living sculpture, on the contrary, we found the charm of a leisurely search for the perfect form. If you are closer in spirit to the classical approach, you can make topiary as it worked the Romans, followed by the gardeners of 18-19 centuries. What do I need? A lot of patience, imagination and well-sharpened tools: garden or hedge trimmers, Lopper, Pruner, wooden slats. Here are a few tips on how to make a classicTopiary. Start "sharpening" skill best on simple geometric shapes. The more that a simple three-dimensional shape can be easily complicate, transforming it into another - turn the cube into a ball, cylinder or pyramid - in the cone. To begin with the identification of "patient" for yourthe first exercises. So, go on a quest. Your goal - a tree or shrub from the age of 5 years and older, with well-developed root system and crown size larger than the intended size figures. A nice way to make a topiary, choose from plants such as spruce or barbed, cotoneaster brilliant, physocarpus purple, hawthorn pinnatifid, Tatarian maple. 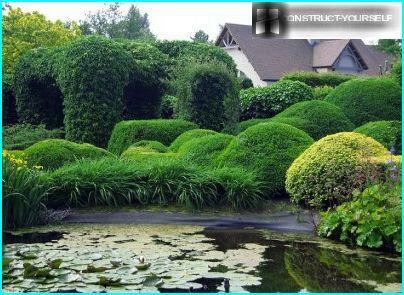 Topiary haircut is best done in March or April, or June to August, but did not fall, so as not to weaken the plant before hibernation. On the ground, under the tree crown is necessary to draw a square with the desired side of the cube length. In the corners of a square set wooden slats or bamboo sticks with a diameter of 2-3 cm, and seal from each other by horizontal cross bars - this will be your benchmark framework. With the help of hedge trimmers do the rough cut, tracing the contours of the approximate figures - start from the top edge, then treat the side. After checking side of the cube to the curvature, tweak the plane and go to the finish trimming, and even trim the volume gradually. The final touch swipe shears, removing twigs, out of the general mass. It is important to know! 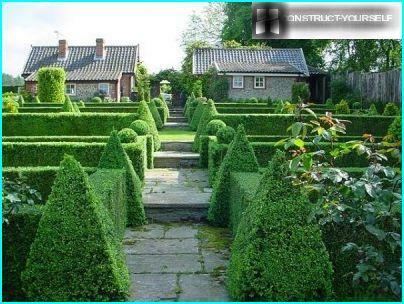 Periodically move away to a distance of 3-4 meters from Topiary, distance to estimate the correct form. 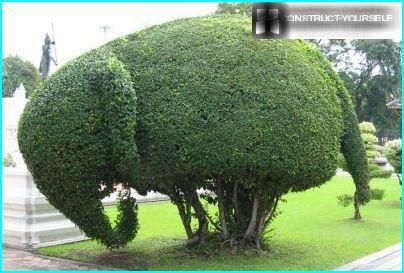 Topiary in the form of a ball can be made from the bottom,truncating his face. 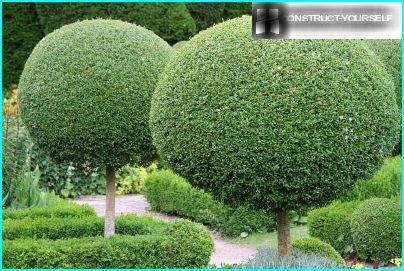 The most suitable plants for spherical Topiary: Salix purpurea, Berberis thunbergii, physocarpus, Thuja occidentalis, spirea gray, spruce, yew, boxwood and many others. Cylindrical Topiary, as a rule, can be easilymake western arborvitae, a variety which by nature has the form of a column. 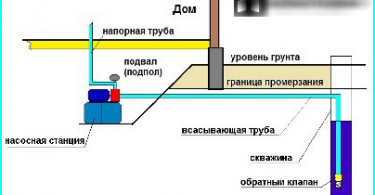 Satisfactory cylinders can be obtained also from European larch, irgi rotundifolia, linden. 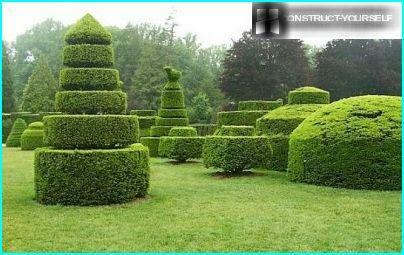 The principle of shearing topiary the same column as the cube. Under the crown of the tree drawing a circle, set the guides wooden stakes and more boldly than you conquered the cube, cut out a cylinder. Not bad look Topiary in the form of a cone andfrustoconical. In order to build a framework for conical topiary, prikopat least three poles and fasten them in the middle, in the place of the imaginary apex of the cone of the future - in the likeness of an Indian tepee. Again, to help novice topiariusam comes to the aid of nature itself, creating a thuja western with conical shape "emerald" crown. Coaching hardness hands, you can latertry their hand at performing pyramidal topiary with three or four faces, arranging in his garden a mini-set of the Egyptian pyramids, giving your site a completely unique look. 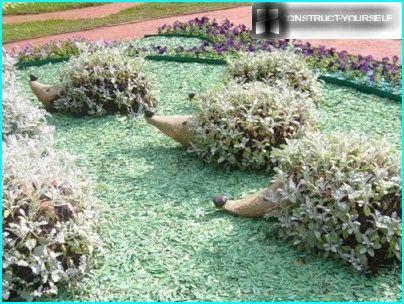 Bringing their skills to perfection, you will gradually move to the creation of such complex green sculptures, like a spiral, longline geometric volumes, and combinations thereof, and not far off - the shapes of animals and humans. 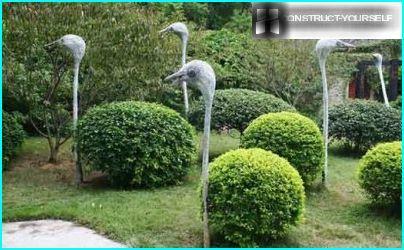 Significantly simplify the process of shearingclassical topiary removable metal frame that hoisting the crown on top of a tree or bush. 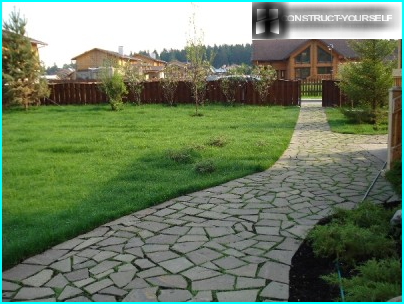 This auxiliary element is used in order to make it easier to do with their hands and Topiary is the best fit for beginners topiariusov. The plant "lives" in a mesh garment,adjusting to the desired shape, and you can only trim unruly branches, making their way in spite of the imposed growth trajectory. After the formation of the crown, the frame is removed. 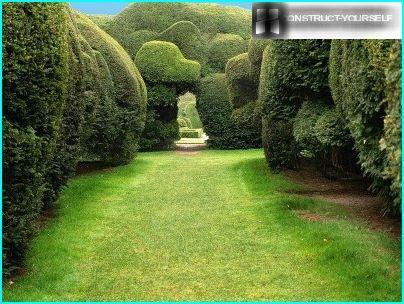 However, with a similar approach to how you can do Topiary, many gardeners do not agree - as the plant tends to grow together with its "dress" that it can not be removed without damaging the crown.